Today is National Pie Day. 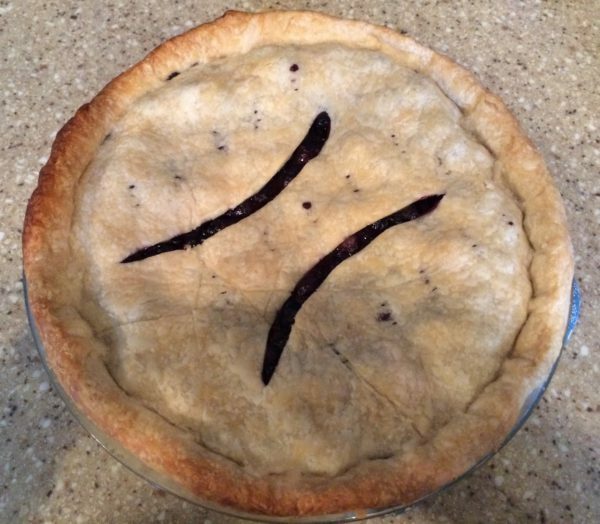 Here’s a photo of a blueberry pie that I made a couple of years ago. Whenever blueberries are on sale, I manage to bake a blueberry pie. It’s one of my favorite kind of pies. I’ve often been known to eat a piece of pie for breakfast along with a scoop of ice cream. In my latest book, A FAMILY TO CALL OURS, the third book in my Front Porch Promises series, the heroine loves to bake pies. Here’s a scene from the book in which the heroine is bringing one of her pies to Thanksgiving dinner. “I think you mean you can’t wait to play with Sadie.” Tara chuckled as she carried the pumpkin pie with care. She didn’t want to fall down and wind up with her face planted in it. “No. Everyone’s there except us.” Hailey pointed to the cars parked along the lane. Tara nearly dropped the pie. To Hailey, living with Caleb meant having a father, something she’d never really known. “Don’t you love Caleb?” A little frown marred Hailey’s expression. “I think you should love him more, so we can have a real family.” Hailey let her lower lip protrude as she turned and marched toward the house. With a heavy heart, Tara trudged behind Hailey and prayed that her child wouldn’t make such a pronouncement in front of Caleb or his family. The Fitzpatrick clan was gathered at Caleb’s house for Thanksgiving, and Hailey hadn’t stopped talking about it since they’d been invited. On the other hand, Tara’s stomach roiled at the thought of meeting Caleb’s brother, aunts, uncles, and cousins, even more now that Hailey had made her desire for a family known. Would Caleb’s family like her? She didn’t know why she was worried. Tom and Sheila approved of her relationship with Caleb. The past three weeks had flown by. True to his promise, Caleb had helped Hailey make a snowman, not only the day after the first snowfall, but after the two subsequent snows that had occurred over the next three weeks. The area looked like a real winter wonderland. He’d also taken both of them to the Boston Common Frog Pond, where Hailey had tried her hand at ice skating. With every passing day, Tara’s efforts not to fall in love slowly slipped away like a slow glide on a skating rink. Had Hailey sensed the change? Is that what had prompted her growing wish for a family? Tara added that to all her other worries. Thanksgiving with all the Fitzpatricks meant Caleb’s house would be overflowing with people. She wasn’t used to large holiday gatherings. During her childhood, Thanksgiving dinner usually consisted of her grandparents and her grandmother’s widowed sister and maybe someone from Stockton who didn’t have anyone to share the day with. Last year she’d had Thanksgiving with the women and children at the shelter, and the year before in the hospital with Hailey. Today she prayed for wisdom. She wanted to make a good impression. When she reached Caleb’s house, she stomped the snow off her boots as she made her way up the steps onto the front porch. Before she could knock, Caleb opened the door. “I can do that.” Tara stepped toward the refrigerator. Tara pasted a smile on her face and gave a little wave. What did it say about her relationship with Caleb that Sheila didn’t mention it? Maybe she was leaving that for Caleb. No sense in reading anything into Sheila’s introduction. Sheila went around the room giving the names of the ladies there. Her two sisters, Sharon and Silvia. Her three sisters-in-law, Linda, Mary, and Janet, and a couple of their daughters. There were too many names to remember. Lastly, Sheila introduced her daughter-in-law Melissa, a pretty brunette with a ready smile that put Tara at ease for the moment. As the ladies chatted, Tara learned that the families had traveled from as far away as North Carolina and as close as western Massachusetts. She couldn’t help wondering whether she could fit into a big, happy family like this one. “Okay.” Tara tried to smile, a feeling of dread coming over her. She hoped she could get through this day. She should be grateful for having someone to share the holiday with. After all, it was Thanksgiving. Tara tried not to let the group intimidate her as Caleb nudged her farther into the room. “That’s a kid’s job, you know.” The man laughed again. Caleb didn’t respond to the remark, but a muscle worked in his jaw, as if he was biting back a retort. He hadn’t introduced her as his girlfriend. Did he not want his relatives to know they were dating, or was he trying to spare her more teasing? Caleb’s old girlfriend was probably a blonde. Tara didn’t know what to think about that either. She cautioned herself not to overthink. Caleb had warned her about the teasing. She guessed this was part of it. In the next few minutes, Tara met the rest of the clan, including Caleb’s other uncles—Danny, Sean, Michael, and Phil. At the end Caleb introduced her to his brother, Joshua. Tara didn’t know how to respond to that either. Should she acknowledge their relationship, since Caleb hadn’t mentioned it? This was getting more awkward by the minute. “I see that my kids are having a great time with your daughter and that puppy.” Joshua motioned to the other side of the room. “I have a pretty good idea that she has some help from Sadie’s owner.” Tara gave him a look that dared him to deny it. The jovial mood continued as the men made sure the TV was tuned to the station with football. Tara wasn’t sure why she was the only woman not in the kitchen. How could she excuse herself and not give the impression that she was trying to get away from Caleb? While she was trying to find a solution, Sheila rescued Tara and took her back into the kitchen. Feeling less intimidated, Tara joined the other women as they worked on the final preparations for the meal. When everything was ready, everyone bustled into the dining room and gathered around the table that had been stretched to its full length by adding every available leaf. It filled the entire room, with barely enough room for the chairs. Even the children who would sit at a smaller table set up in the living room on the other side of the foyer joined the adults for the Thanksgiving prayer as they joined hands in a big circle. Caleb stood next to Tara in the circle. He took her hand, and his smile warmed her heart. She was so thankful for his presence in her life, but she wasn’t going to say that out loud in the group. As the prayers of thanksgiving went around the circle, Tara closed her eyes and thought about all the things besides Caleb that she was grateful for. The prayers of the others reminded her of more things for which she should be thankful. Tara fought back more tears and sniffed as Caleb squeezed her hand again. Tears threatened to roll down her cheeks. Without a free hand to wipe the tears away, they trickled down her face despite her efforts to blink them back. Tom closed the prayer, giving thanks for the food. A collective amen sounded through the room as the circle dispersed, and people lined up to go through the buffet line assembled in the kitchen. “Any time you need a laugh, just call on me.” He gave her a silly smile. “You hadn’t noticed that she’s a picky eater?” Tara whispered back. Nodding, Tara wondered whether that had anything to do with the woman who had broken Caleb’s heart. Did that old romance ever cross his mind now that they were dating? Tara pushed the question away. She shouldn’t worry about Caleb’s past love life, but she knew her relationship with Blake still colored her thoughts about falling in love again. But today was Thanksgiving—a day to be happy and grateful for the good things in her life. Caleb was exactly that—a good thing. Right now the first book in this series, A PLACE TO CALL HOME, is on sale for 99 cents. Be sure to get your copy before the sale ends. I will give away a copy of the second book in the series, A LOVE TO CALL MINE, to one person who leaves a comment. I will draw the winners name on January 25, 2017, at 9PM MST. I enjoy pies- apricot, blueberry, raspberry, but even savoury pies like a good curry pie, yum! Wemble, it’s fun to see your name or a family name in a book. I rarely see my name, although I did watch a Hallmark movie recently, and the heroine had my name. I really enjoy this excerpt. So different from your last post about how they’d met. This is really in my TBR pile. Now I just need time. I can see how it will be an emotional story. Priscilla, thanks. I hope you enjoy the book when you get time to read it. I enjoyed the excerpt, Merrillee. Thanks for sharing. Your pie looks like a work of art compared to some of the pies I’ve attempted to bake…cookies are my specialty. I’m not a big pie eater, but my favorite is apple. Jill, you’re welcome. I like to make cookies, too. I like to bake but not cook. My favorite pie is lemon meringue, but also enjoy cherry, peach, blueberry, and pumpkin pie. Fruit or pumpkin pies are especially tasty for breakfast with whipped cream and steaming cup of coffee, since I feel that is nutritionally sound – I am having fruit and dairy. Now being retired, I also enjoy having an afternoon piece of pie with coffee. Have a piece on me. 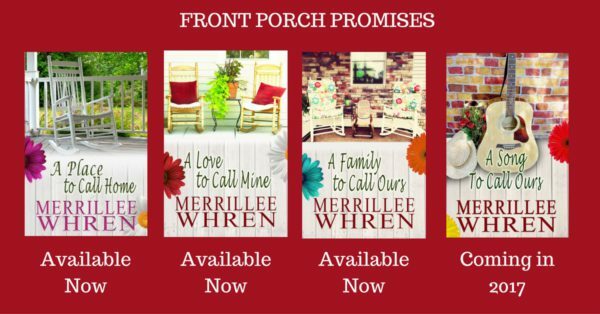 Merrillee, all your Your Front Porch Promises inspiring romances sound interesting. I enjoyed reading A Place to Call Home. Happy Writing and the excerpt. Renate, thanks. I like your thinking about pies. I’m glad you enjoyed A Place to Call Home. Thanks for sharing the excerpt – looks like a great story! My husband makes a great blueberry pie, or so I’m told, since I haven’t eaten it. My favorite is apple, or maple sugar, which I could eat anytime! Julianne, I’m impressed that your husband bakes pies. My husband wouldn’t know where to begin to make a pie. I love blueberry pie , but I’ve never tried to make it. I’ll have to try sometime. I make pumpkin pie ,without milk ,due to an allergy. It turns out well surprisingly. I also make lemon meringue. I’ve always thought pie qualifies as breakfast food. It either has fruit or vegetables like pumpkin. Diana, great minds think alike. What do you use in your pumpkin pie rather than milk? Water, or almond milk instead of milk. The first time I tried it, I thought I would have to throw it away. It actually sets up with the eggs,water,pumpkin and sugar. My standby pies to make are pumpkin and apple, though wild huckleberry is also awesome! Thanks for the excerpt, Merrillee! Valerie, I’ve never had huckleberry pie. Are huckleberries wild, or do you grow them? Great excerpt. This series will have to go on my wish list. My favorite pies are huckleberry, peach, eggnog, and chocolate cream. Thanks, Beth. I’m going to have to check out huckleberry pie since it seems to be popular. Lovely, Merrillee! The pie and the excerpt! I ordered this book but haven’t read it yet, however after reading the excerpt I can’t wait to read it already has me hooked! Thanks for ordering the book. I hope you enjoy it. Autumn, it sounds like Valerie can help you out. It is always a pleasure to read your books. Thanks for a sneak peek! I love apple and egg custard pies. Hi Merrillee! I love pie, especially fruit pies! I’ll take pie over cake any day :-) One of my favorites is Marionberry, it’s a cross between two different types of blackberries and found only in Oregon. My second favorite is a deep dish dutch apple; warm with a generous scoop of vanilla bean ice-cream. Yummy!! Thanks, Trixi. I have never heard of Marionberries. I’m learning all kinds of new things about pies today.